There are a number of great online GIS ( Geographic Information System ) solutions out there, ranging from Mappoint to Mapquest to some cool PHP projects. However, it is still nice to be able to be able plot you own data and put some basic mapping utilities on your site with a minimum of fuss and bother. Over the next couple of articles I will hopefully be able to give you a few pointers on how to create you own basic GIS system for free. I do not claim to be a GIS expert, and there may be better ways to do things, but hopefully these articles will give you a start in the right direction. In this article we will start with the absolute basics – plotting a single location on a pre drawn map of the world. Later articles will go into drawing vector maps, drawing roads and rivers and labeling objects all using the principles in this article. To plot an object on any map, be it a house or a herd of caramelized Wombats, the object needs to be geocoded – that is have a map coordinate allocated to it. For all examples we used a standard longitude (long) and latitude (lat) coordinate. There a numerous other coordinate systems out there – some a lot more accurate, but this is the most common, the easiest to plot and suits our needs. The downside of directly plotting long/lat coordinates is that you will get distortion as you near the poles. However, for our uses this doesn’t pose a problem. There are a number of ways to finding the long/lat of a point in the world, however a quick and easy way is to used Microsofts online GIS service Mappoint ( http://www.mappoint.com ). Find your location using Mappoint search utilities and make sure it is in the center of the map. Right mouse click on the map, and you will find long/lat coordinates embedded in the URL of the map image. It is also worth looking at http://www.geogratis.com, plus a number of government operated environmental sites will have map data which you can download for free. Those of you who have Mapinfo will also find very useful geocoded data on the sample discs which come with it. 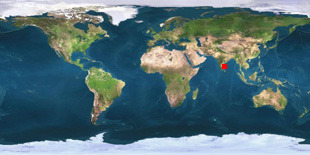 The point we are plotting for this article is my current location which is Chennai – Tamil Nadu – India. We now need a base map to plot our point on. In future articles we will generate this ourselves, however to start we will use a simple pre drawn JPG file. The base map we are using is called earth_310.jpg, and is and view of the earth in what is called a Cylindrical projection. The original of this image can be found in various forms all over the web in various sizes and scales. A cylindrical projection is the simplest projection to plot long/lat coordinates onto, again with a minimum of conversion needed reducing processor overhead. For our purposes you can simply right click the image and “Save picture as …” to your hard drive. The base map is scaled to 310×155 for ease of use, but you can rescale this map to any size. We are now ready to generate the code to plot our point. Convert and scale the long/lat coordinates to screen coordinates. Return the finished map as an image. To convert the long/lat to screen coordinate we have a created a function called getlocationcoords. This takes the longitude and latitude coordinates plus the size of the base map and return the screen coordinates in an associative array. $width and $height are calculated from the size of the background image. In future projects these variables are used scale the map and set the zoom level. Once the coordinates have been converted it’s as simple as drawing a rectangle on the base map using the returned array to mark our location. // These are the coordinates the location we wish to plot. // These are being passed in the URL, but we will set them to a default if nothing is passed. // First we load the background/base map. We assume it’s located in same dir as the script. You could easily modify this code to read long/lat coordinates from a database or a delimited text file and plot multiple points. This is a very basic script. However the basic principle will allow you to draw very complicated maps. The important part is the getlocationcoords function – once you have geocoded your data and have the routines to plot the points on the screen, the sky’s the limit! I have some high res aerial photographs of my area and have been trying for a better part of a year to put that information on an xy map, so when an icon (square) is hovered basic information is viewed and when clicked comments can be see.